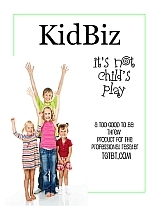 KidBiz: It's Not Child's Play is a 31-page Product for the Professional Resaler, designed as a supplement to the Manual, specifically for those who sell childrenswear and equipment as part of a family shop or as a specialty. 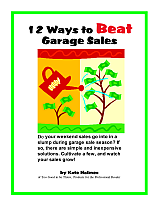 How to Compete with Garage Sales Get shoppers (and suppliers!) 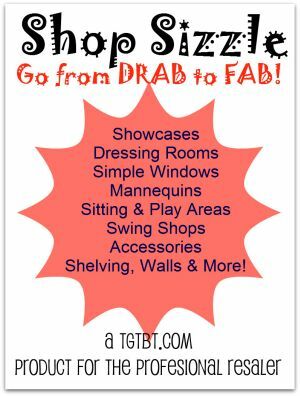 into your shop instead of losing business to garage sales. A PDQ book directly from Kate to your computer. Customer Service Brochures Take-homes to remind a busy parent about your shop include How to Shop Resale for your Kids, Out Out Darned Spot, The Harried Shopper's Quickest Recipes, and Quick Recipes that Kids Love. The cheapest and most effective store give-away! Shop-Sizzle Easy, effective, economical ways to make your shop look as great as your selection. Especially important with the variety of merchandise in childrens' shops! No space for a play area? Possible solutions to keep kids occupied and out of the way: Put some of these GelGems on the bottom of a mirror, add a mini bean-bag chair, and you're set. Earnshaw's is a retailer/ manufacturer magazine from Canada. Great reading re trends, what's selling, more. GiggleGuide is a site for childrenswear retailers. High-end childrenswear guide by James Girone. Who'd have thought? Fun kids' activity pages from the US Patent Office! Remember, these are suggestions, not recommendations. Be sure you are comfortable with these vendors before committing a lot of money. Tights and socks for kids and adults. Bobux, & Jack and Lily: soft baby/toddler shoes.